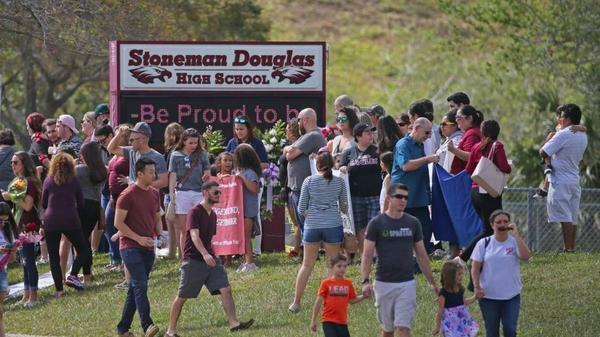 Parents and students return to Marjory Stoneman Douglas High School on Feb. 25, for the first time since the shooting that left 17 dead. Parents of victims are pushing to make schools harder to penetrate. Enacting gun control has been the main focus for some survivors of the Marjory Stoneman Douglas High School shooting — and some parents of those who died. But Max Schachter, who lost his 14-year-old son Alex in the shooting, believes the most important thing to do now is to make schools harder to penetrate. “Until we do that, kids will continue to die in classrooms,” said Schachter during a press conference on Monday. Schachter joined April Schentrup, whose daughter, Carmen, was also killed, in endorsing a slate of more than 100 proposed changes to school safety and security procedures. A task force of local leaders in Broward County unveiled the plan on Monday, pushing for single points of entry, bulletproof classroom windows and doors and a greater investment in police officers assigned to patrol school campuses. Schachter also stressed schools should reconsider their protocols for fire alarms. The report calls for staff members to confirm there’s actually a fire before evacuating students. On Feb. 14, the shooter’s gun set off fire alarms on campus at Stoneman Douglas, sending students into hallways where they were targets. Schachter said he believes if these changes had been in place earlier, his son would still be alive. He will be in Washington, D.C., later this month and hopes to meet with President Trump to advocate for improving school infrastructure nationwide. (Read all of the school safety task force's recommendations here). Schentrup, whose daughter would have graduated this weekend, is taking next year off from her job as principal of a Broward elementary school. She wants to help Schachter in his efforts to improve school safety, especially for her other daughter, Evelyn, who still attends Stoneman Douglas High. A couple weeks ago, Schentrup called out Superintendent Robert Runcie at a school board meeting for how the district handled her requests for time off after Carmen, who was 16, died in the shooting. She said on May 22 that she had requested a full-time interim principal to take over for her at Pembroke Pines Elementary School while she grieved. “Mr. Runcie was quick to say that being a principal was not a part-time job,” she said at the meeting. At first, the district docked her pay for the time she took off to grieve for her daughter. But they later reinstated it through the end of March. Runcie eventually granted her request for an interim principal at the school, and he recently offered her a sabbatical for next year, she said Monday. Schentrup said her family chose not to attend the graduation ceremony on Sunday. Two of Carmen’s friends crossed the stage at the BB&T Center to accept her daughter's diploma. “We did have some of Carmen’s friends over to the house earlier this week," Schentrup said. "We want them to be happy. We want them to excel. We want them to be successful." She trailed off. “It’s very difficult,” she said. Copyright 2018 WLRN 91.3 FM. To see more, visit WLRN 91.3 FM.